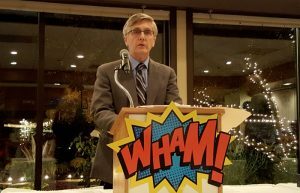 Earlier this year, The Lombard Company was presented the Spirit of Sertoma Corporate Citizen of the Year Award from Sertoma Centre, Inc. This was the Centre’s inaugural corporate citizen award. The award was bestowed upon The Lombard Company for its long time commitment and dedication to the support of the developmentally disabled. Our support of Sertoma’s workshop and training center has helped many of their clients achieve dignity through work. We were truly honored to receive this special award. Mike Lombard, pictured, receiving the Spirit of Sertoma award. The Lombard Family who own and operate The Lombard Company located in Alsip was honored and awarded with the LeRoy M. Corradino Spirit Award at Park Lawn’s 30th Annual “A Day in the Sun” Golf Invitational. 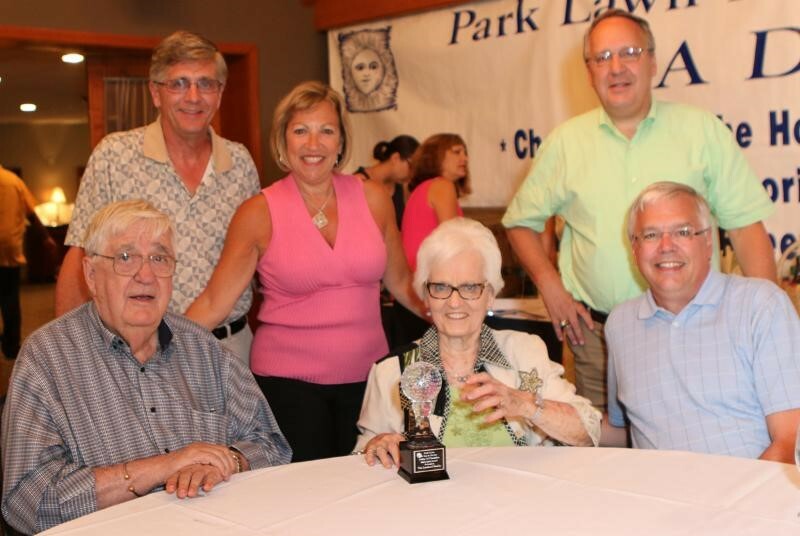 Six years ago, Park Lawn established the award in memory of LeRoy M. Corradino, a long-time supporter and member of Park Lawn’s “A Day in the Sun” committee. The award is presented to an individual or company who exemplifies LeRoy’s ideals and spirit of preserving Park Lawn’s future. The Lombard Company was hired as Park Lawn’s general contractor and began the monumental task of rebuilding Park Lawn Center. The building consisted of three levels with the cafeteria on the bottom floor and bedrooms on the second and third levels. Today, Park Lawn Center stands as one of the few facilities in the State of Illinois designed specifically to care for individuals with profound and complex needs. Park Lawn is grateful to the Lombard family for their continued corporate and individual support for those with intellectual and developmental disabilities. 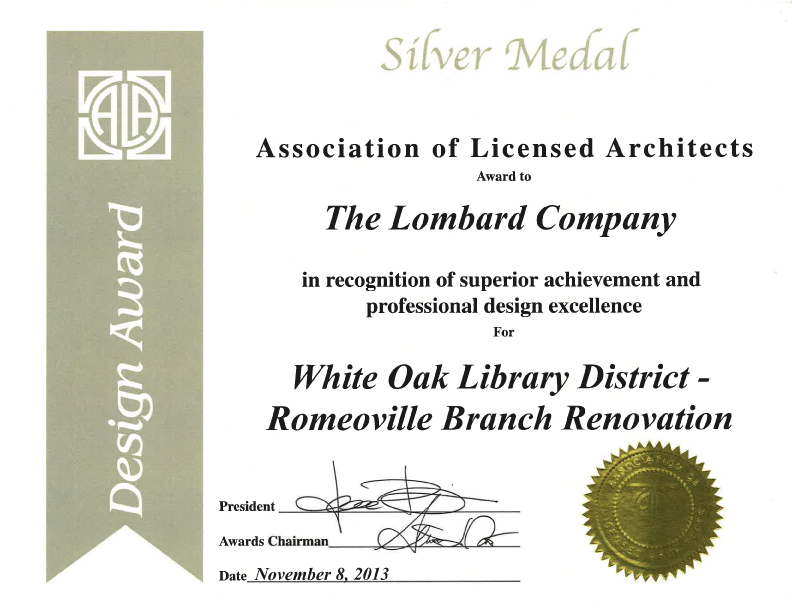 A panel of judges from the Association of Licensed Architects has designated the newly renovated Romeoville Branch Library of the White Oak District as a Silver Medal Award winner. The project was feted for professional design excellence and superior achievement. Upon completion of the phased renovation, the project nearly doubled the amount of space used by the library at the branch to 46,000 sf. In addition to the interior work, extensive exterior work rejuvenated the building façade, entry and landscaping. The library now enjoys state-of-the-art technology and audio-visual systems. The library remained open to the public throughout the work at 201 W. Normantown Road in Romeoville. The Lombard Company was the general contractor for the Dewberry designed project. 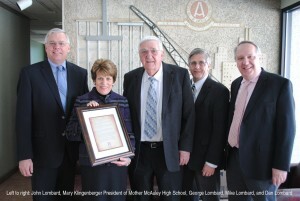 Mother McAuley Liberal Arts High School Gives The Lombard Company Special Recognition. 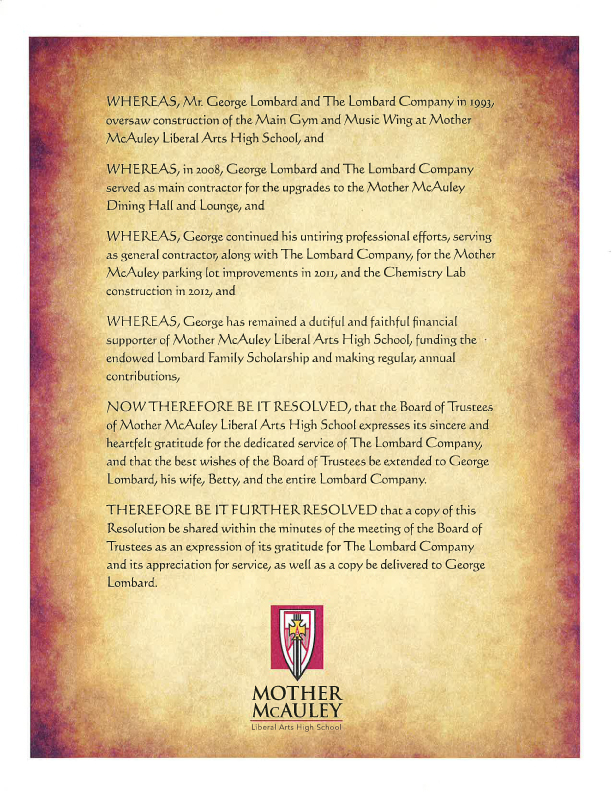 The Lombard Company received an official resolution from the Board of Trustees of Mother McAuley Liberal Arts High School. The resolution was an expression of gratitude and appreciation for The Lombard Company’s long history support for Mother McAuley High School, and for completion of many construction projects for Mother McAuley High School from 1993 to 2013. Mother McAuley Liberal Arts High School is an all-girls, Catholic high school founded in 1956 by the Sisters of Mercy. It is located in the Mount Greenwood neighborhood of Chicago. It is the largest all-girl high school in the country. 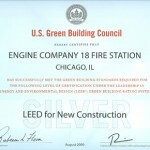 The Lombard Company and Chicago Engine Company 18 Fire Station awarded Silver LEED Certificate by the U.S. Green Building Council. Leed Certification is administered and awarded by the U.S. Green Building Council, a Washington based nonprofit coalition of building industry leaders. This council promotes design and construction practices that increase profitability, reduces negative environmental impact of buildings, while improving occupant health and well-being. Leed Certification is only awarded after a rigorous examination process by a qualified third party team. 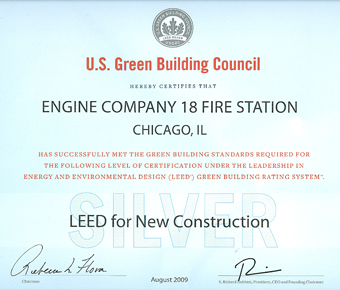 The Lombard Company, along with Chicago Engine Company 18, is proud to have been awarded this coveted certification. Mary Bartelme Park in Chicago, a unique new concept constructed by The Lombard Company wins coveted Best Open Space Award. Michael Lombard attended the 2011 Friends of Downtown annual awards ceremony on May 12th at the Haymarket Pub & Brewery in Chicago, at which The Mary Bartelme Park, completed in 2010, was honored as “Best Open Space” project. The project was designed by Site Design Group and is owned by the Chicago Park District. Lombard and the recently completed Camp Sagawau Center earns Gold LEED Award. The new Sagawau Environmental Learning Center near Lemont was recently accredited as LEED Gold-certified. The project was designed by McDonough Associates, Inc., constructed by The Lombard Company and is owned by the Forest Preserve District of Cook County. The Lombard Company continues to excel in the important, Green Building Technology field with yet another LEED Certified building. The White Oak Library District selects Lombard to renovate current library in Romeoville. The library board invested considerable time and effort to prequalify contractors it felt best suited to complete this project. The Lombard Company submitted the low bid and was awarded the $6.3 million contract. Located at 201 W. Normantown Road, the two-story, 48,000 square foot building will be renovated in two phases, allowing the library to remain open during construction. The first phase will include the basement. Once the basement renovation is completed, library operations will move downstairs as work begins on the first floor. Scheduled for an April, 2012 completion, the upgraded facility will have twice the previous floor area, taking over space that was previously leased out. Lombard awarded contract for new park in Olympia Fields. The Tolentine Park Development awarded The Lombard Company the contract for a new community park with special water features. This exciting new park is located at 20700 Governors Highway in Olympia Fields. The park is owned by the Olympia Fields Park District. Planning and design by Brusseau Design Group, LLC of Hoffman Estates. Construction has begun on the park. Homewood-Flossmoor District 233 office remodel goes to Lombard. The Lombard Company won the contract over several other contractors in very competitive bidding. The project consists of 3,600 square foot administration office remodel at the south building of Homewood-Flossmoor Community High School campus. The architect is DLA Architects, LTD., Itasca, Illinois. Midwest Construction Magazine awards The Lombard Company a 2009 Best of Awards, recognizing building excellence. Recently Lombard added another award to a long list of accomplishments. 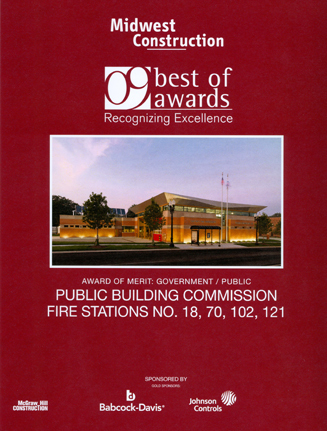 This award, The Midwest Construction Magazines 2009 “Best of Award,” recognized The Lombard Company for building excellence for Chicago’s Engine Company 18 Fire Station. Aldi and The Lombard Company a great team. Lombard is very pleased to have the grocery store giant Aldi as a major client. Aldi’s growth is based on a simple concept. Give your customers the most value for their money. The concept is one that also applies to Lombard’s philosophy. This continuing relationship is a testament to Lombard’s dedication and quality construction. The Lombard Company recognized for Job Site Safety. The Lombard Company’s on site safety performance was recently recognized with a Builders Association (BAGC) Safety Award. This award was developed to recognize and reward local general contracting firms who achieve the highest level of safety performance on their jobs. In addition, The Lombard Company received two national awards from The Associated General Contractors of America (AGC), the first for have a zero incidence rate and the second for having an incidence rate 25% below the building division national average. Safety is an inherent part of The Lombard Company’s corporate culture.